[Solved] How to add an upgrade that disallows all units of that player from attacking buildings with a certain tag? I'm trying to add an 'upgrade' that will disallow all units of a player from attacking certain types of buildings. I'm not sure how I would do this. Have a Buff behaviour on the buildings that uses a requirement that counts the upgrade then have a Unit Compare Behavior Count validator on the first effect of your weapons. Sorry I didn't really do a good job of saying what I meant. I am trying to make it so that a player's units cannot attack any certain buildings of another player (lets say those with a armored tag or those with a certain buff if that would be easier) unless the attacking player has/doesn't have a upgrade. 1. Create two weapon one with "armored allowed" and another with "armored excluded"
2. 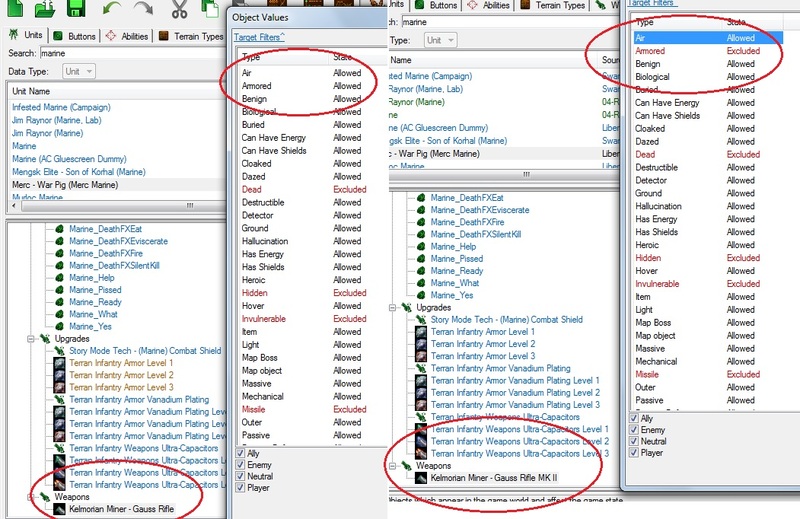 Create research upgrade that will add "weapon with armored allowed" to the unit of said player and remove "weapon with armor excluded". 3. Or create a trigger to add "weapon with armored allowed" to the unit of said player and remove "weapon with armor excluded". See screenshot for better explanation. Sorry I have been very busy the last few days. I tried your solution tonight and I created 2 weapons like you said and that part works well. I have decided to have 2 weapons, one for attacking the armored tag and one for attacking everything but the armored tag. However the problem I have is with applying the upgrade to all current and to be built units. I would prefer to have units have the armored attacking weapon, but have it grayed out and disabled. By acquiring level 1 of an upgrade the unit will then have the weapon enabled. I have tried looking around the editor in the unit, weapon, and upgrade sections and haven't found the enable/disable weapon tag. I was sure that I saw a tag like this a long time ago. Even if that tag may not exist would doing this be possible? The Buff behaviour can disable weapons. have a buff that is on by default but removed when the upgrade is researched.